I'm sad to announce that this will be my last regularly-scheduled column for Knitty. Although I plan to continue to submit stories and patterns to Knitty, I'm not able to commit to having something ready for every single issue. I've been honored to be a part of the Knitty community for the past several years and to be able to share my stories, essays, dreams, and designs with you every season. For my last official Ethnic Knitting Adventures column, I'd like to leave you with an essay about one of my favorite places in the world: Lithuania. As many of you know, my family comes from this part of the world, nestled between Poland, Belarus, and Latvia in Eastern Europe. I visit "the old country" as often as I can. After my first trip, I fell in love with Lithuania and have been doing research about the history and styles of knitting there since 2007. During this time, I've written about Lithuania here ("Lithuanian Riesines (Wristers)") and "Made in the USA", as well as for other magazines, I have put out a video course about knitting socks using Lithuanian techniques and colorwork designs, and I have been working on a book that is -- knock on wood -- going to the printer next month! 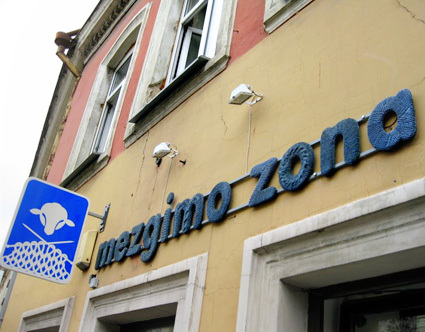 Cones of linen yarn at Mezgimo Zona. One of the best things I discovered in Lithuania is linen. Although my favorite fiber, wool, is hugely popular for knitting in America and many other places, it isn't appropriate for every project. Some people are allergic to wool. Some prefer not to wear fibers made from animal fur. Some live in warm climates where wool is uncomfortably hot. 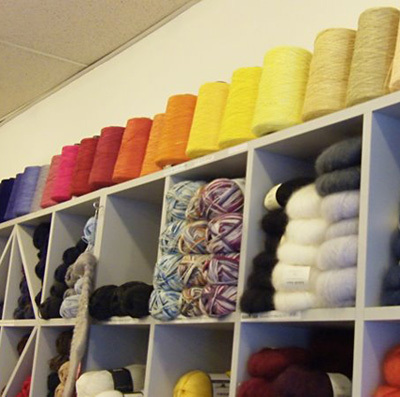 Others enjoy knitting with and wearing different kinds of fibers for different projects and situations. Still others, myself included, have hot flashes and find that they can't wear their favorite wool sweaters any more, except during the dead of winter. I fell in love with linen when I bought a swingy hot-pink machine-knitted top at a linen shop in Vilnius a few years ago. I found myself shopping in the middle of a humid summer when I could not go anywhere without handkerchiefs to wipe the perspiration from my forehead, and the cool, lightweight linen clothes on the racks of so many stores were just what I needed to spruce up my travel wardrobe. At home, this top has become a key part of my teaching wardrobe. I love linen, but it's hard to find in American department stores—at least at prices I can afford. Because flax is grown and linen yarn and fabrics are manufactured in Eastern Europe, and Lithuania was not yet on the Euro, the prices were often much lower than I could find at home. I also found fine linen yarn in many of the local shops, and on every trip I've carried home a cone or two. Linen is -- and has been throughout history -- very popular and held in very regard in Lithuania. Although wool was undoubtedly important for making warm winter clothing in past centuries, its production was less culturally important to the Lithuanians than that of flax. There are many folk tales and songs about flax and linen, but very few about sheep and wool. The wool of Lithuanian sheep is comparatively coarse, and was spun into relatively thick yarns used for socks, mittens, and gloves. Linen, on the other hand, was spun into fine thread for weaving clothing, towels, and bed sheets, and for use as sewing thread. Many more hours of a woman's life were spent with linen than with wool. Flax growing and linen production touched every part of life in the Lithuanian countryside. 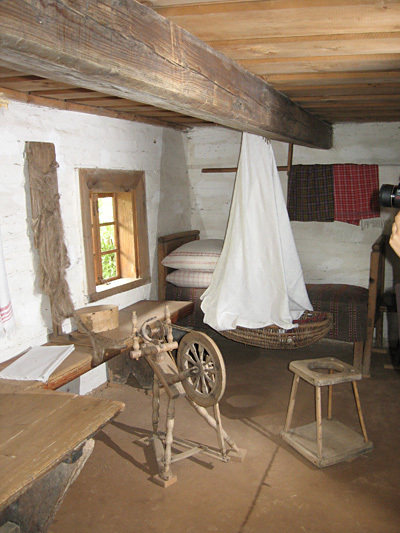 Spinning flax and weaving with linen are recognized as important elements in Lithuanian culture and are featured prominently in museum exhibits around the country, as well as in live demonstrations at craft festivals year round. at the Rumšiškės Open Air Museum. Spinning was an integral part of daily life for rural villagers in Lithuania. Yarn has been spun from wool and flax since the Stone Age, and woven textile fragments have been discovered at many archaeological sites. Long after people in Western Europe and America were wearing mass-produced clothing and using commercially made linens, many Lithuanians were still making most of their yarn and fabric from scratch. All the women and girls in a family spun, and the mother managed and assigned all of the spinning tasks. Fine linen threads were spun for weaving a muslin-type fabric and sewing thread, and skeins were tested for quality by drawing them through a wedding ring. Linen (and later cotton) was also used for knitting summer gloves and socks. Linen, because it is so difficult to process and took up so much of women's time, became a central part of Lithuanian culture, rural society, and mythology. The "suffering of the flax" is a common theme in folk- tales and songs, and rituals surrounding the cultivation and harvesting of flax and the production of linen were built into the annual cycle of life. Even the laumės, the mythological fairy-witches of the Lithuanian countryside, were said to spin and weave with linen, and they took a special interest in this area of women's work in the community. If a woman who is spinning calls the laumės, they may come to help her, but they may end up spinning her guts and veins in addition to the flax. These magical stories rarely have happy endings. The realm of the laumės is dangerous, as is the land of the faerie in Ireland. The magic of the Lithuanian lands and the fine linen products fill my dreams when I am home. And wherever and whenever I travel in Lithuania I find wonderful examples of spinning, weaving, and knitting. And I always keep my eyes open for beautiful linen products. Thank you again for following along on my Ethnic Knitting Adventures over the past few years. I look forward to meeting you again here and around the knitting world. Don't stop knitting or having your own adventures! This sweater is inspired by one I bought at a shop in Vilnius, Lithuania. Every time I wear it, I'm asked, "Did you knit that?" and I have to answer, "No." Now I've finally made one! 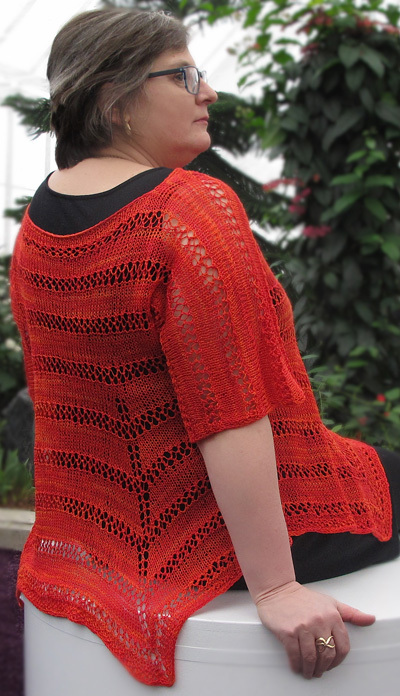 And I'm planning to make at least one or two more with different lace motifs. This is my favorite style top to wear for travel and teaching. It works over a sleeveless dress, over jeans and a tank top, or over black pants and a turtleneck. 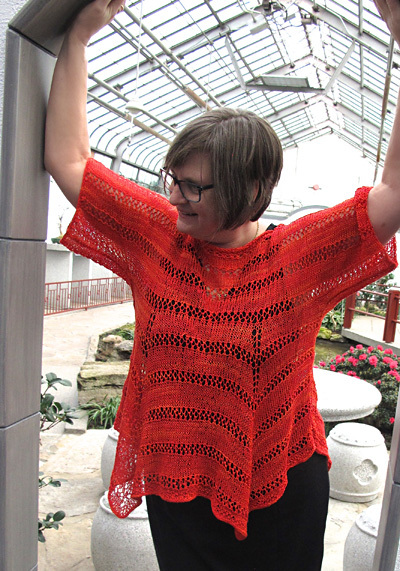 I've designed this to be a very loose garment, with 4-6 inches of positive ease. The upper body should not be snug and the lower body should flow and drape around your hips. If you've never knit with linen before, I suggest using very slippery needles and not trying to pull the stitches tight. I used a US size 6 needle on this sweater where I may have used a size 7 or 8 needle with wool yarn to get the same gauge. I found that knitting looser on slippery needles makes knitting with linen much more enjoyable and less stressful on my hands. US #6/4mm circular needles, 29- to 40-inch. Two needles required. Note: This fabric is very stretchy and will increase in length when washed & blocked. When measuring length as knitting, smooth out fabric or measure hanging to adjust for added length after blocking. This sweater is made from the top down in one piece and worked back and forth. The back is worked first, then the front is picked up at the shoulders with stitches cast on in the center for the boat neck. Both pieces are the same except for the cast on. Short-row shaping is used at the underarms, then the sleeve and underarm stitches are put on hold. Increases are worked to create the points at the hem. When the knitting is complete, the held stitches are returned to needles, stitches are picked up along the sides of the bottom and the side seams are joined with 3-needle bind off. RS rows: K3, work in patt to last 3 sts, sl3 purlwise wyib. WS rows: P3, work in patt to last 3 sts, sl3 purlwise wyif. RS rows: Sl knitwise wyib, work in patt to last st, k1. WS rows: Sl purlwise wyif, work in patt to last st, p1. Rows 1, 3, 5, 7, 9 (RS): Knit. Rows 2, 4, 6, 8 (WS): Purl. Rows 11, 12 and 13: K1, (yo, p2tog) to last st, k1. Note: Read your knitting. On rows 12 and 13, the p2tog is a stitch and the yo to its left. Watch this to make sure you are maintaining patt with no errors. Row 2: [P1, k1] to end. With RS facing, CO 3 sts at beg of row. *K2, ssk (last cord st and first live st from main piece of knitting), slip the 3 sts back onto left ndl. Rep from * until 3 sts rem. BO 3. Using the cable cast-on technique, CO 122[130, 138, 146, 154, 162, 170] sts. Row 1 (WS): P3, pm, p38[42, 46, 50, 54, 58, 62], place removable marker, p40, place removable marker, p38[42, 46, 50, 54, 58, 62], pm, p3. Note: The removable markers will remain on the row on CO edge to indicate placement for picking up stitches on the front. Row 2 (RS): Work I-cord selvage, sm, beg with Row 3 work Stockinette and Lace Stripes to marker, sm, work I-cord selvage. Cont in patt as established until 3[3, 3, 4, 4, 4, 5] repeats of Stockinette and Lace Stripes have been completed. Work 2[4, 6, 2, 4, 6, 2] rows in St st.
On the next row, markers will be placed for Sleeves and Lower Body Shaping - contrast colors will be helpful. Next Row: Knit across 32 sleeve sts, pm for Sleeve, work 17[19, 21, 23, 25, 27, 29] sts in patt, pm for Shaping, work 24[28, 32, 36, 40, 44, 48] sts in patt, pm for Shaping, work 17[19, 21, 23, 25, 27, 29] sts in patt, pm for Sleeve, knit across 32 sleeve sts. Cont in Stockinette and Lace Stripe patt as set, with slip stitch selvage, and work Underarm Shaping and Lower Body Shaping AT THE SAME TIME. Next row (RS): Work to second sleeve marker, sm, work 6 sts, w&t. Next row (WS): Work to second sleeve marker marker, sm, work 6 sts, w&t. Next row: Work to 1 st before previous wrapped st, w&t. Rep last row 9 more times - last wrapped sts are situated next to sleeve markers. Place 32 Sleeve sts on each side on hold for working side seams later. Remove sleeve markers. 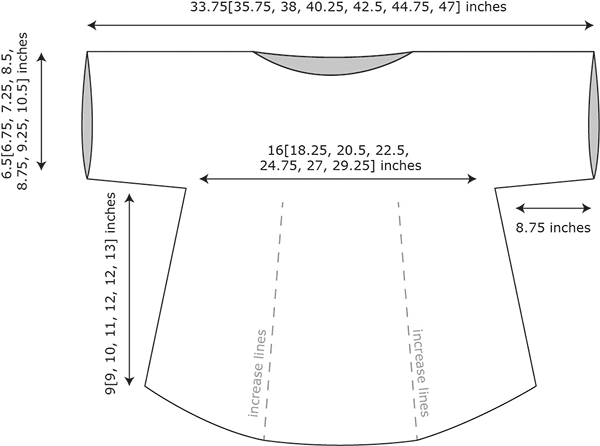 Continue with Lower Body Shaping until piece measures 9[9, 10, 11, 12, 12, 13] inches at side seam, ending on Row 14. Work 4 rows of Seed st while cont to inc on RS rows. With RS of Back facing, pick up and knit 41[45, 49, 53, 57, 61, 65] sts from beg of row to 1st removable marker; using the cable cast-on technique CO 40 sts for neck; pick up and knit 41[45, 49, 53, 57, 61, 65] sts from 2nd removable marker to end of row. Turn work, WS is facing. Work as for Back from [**]. On right edge of Front with RS facing and beg at lower edge, pick up and knit 1 st in each chain along side edge of lower body, then slip held Sleeve sts onto same needle. Purl 1 WS row, working wraps with their corresponding sts at underarm. On corresponding side of Back, with RS facing and beg at sleeve edge, slip held sts onto second circular needle, then pick up and knit 1 st in each chain along side edge. Purl 1 WS row, working wraps with their corresponding sts at underarm. With RS together, use larger needle and 3-needle BO to join side seam, working loosely. Repeat seam on opposite side. Wash and block to dimensions. Allow to dry thoroughly. 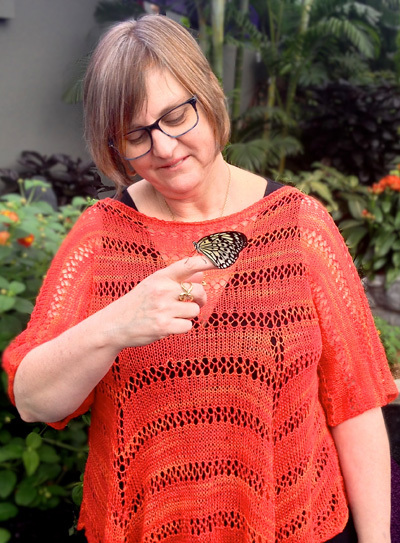 Donna Druchunas escaped a corporate cubicle to honor her passions for knitting, world travel, research, and writing. 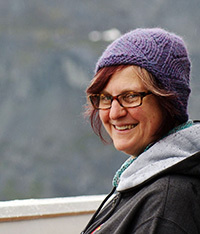 She teaches in the United States and Europe, offers online sock-knitting classes at Craftsy.com, and holds retreats at her studio in Vermont. 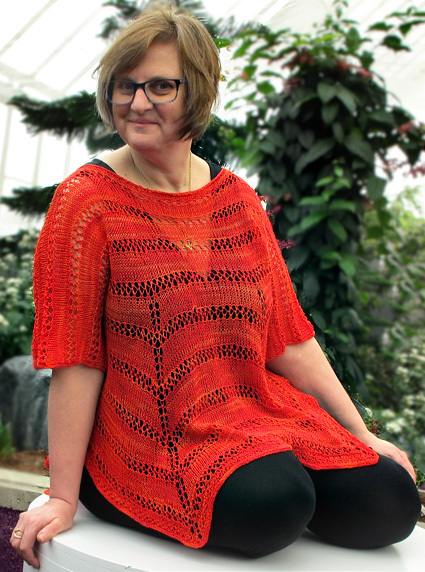 Her newest project, Stories In Stitches is a pattern line featuring stories about knitters and their lives, traditions, history, and travel, all tied together with gorgeous knitting patterns and projects.